Product Review: Box Play for Kids. We’re stuck on ’em. I forgot about the power of stickers… Until my 2.5 year old LadyP recently reintroduced them to me. If you happen to show up at my house unannounced these days, you will find stickers on my wall, stickers on my tables, stickers stickers stickers everywhere. Right now there’s a 3-inch little girl jumping rope stuck to my front window. You think I’m kidding? I loved stickers as a kid, and now my toddler is unsurprisingly following suit. So when the nice people at Box Play for Kids offered an assortment of their modern stickers that repurpose and recycle throwaway boxes into toys, I said BRING ‘EM ON. 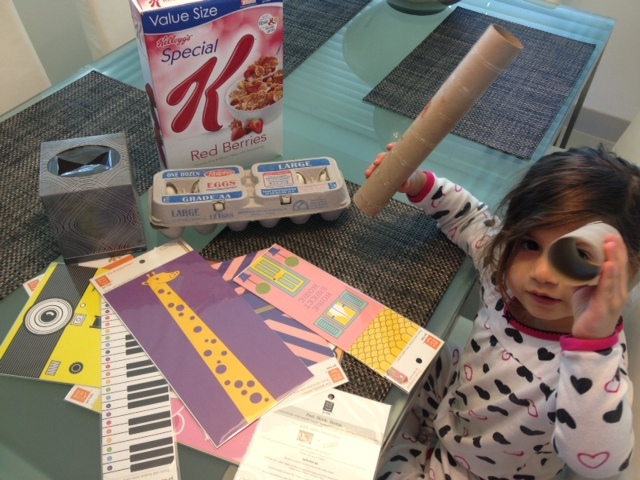 With Earth Day (heck, Earth MONTH) upon us, I figured the timing was perfect to experiment with a fun recyclable craft activity… especially one that’s created by parents. 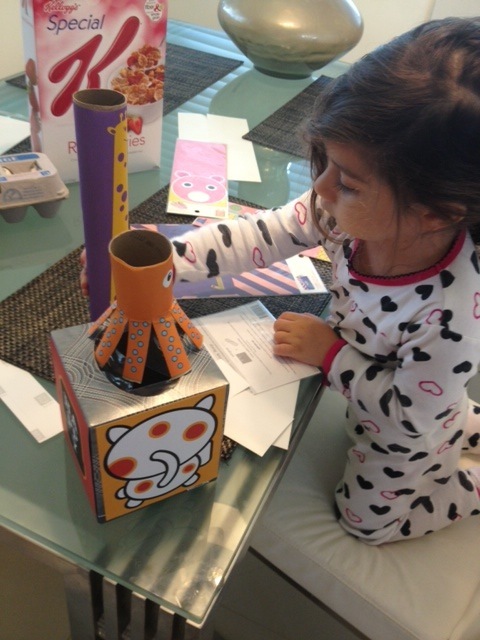 Inspired by their 2-year-old daughter’s love of stickers and penchant for playing with old boxes rather than the many store bought toys, Janette and Greg Harwell had an “aha” moment that led to the creation of turning an old toilet paper roll into a friendly little octopus. Janette (a long-time graphic and package designer) started designing stickers that, when applied to throwaway household boxes, turns them into fun toys that encourage imaginative play. Eco-conscious and naturally detailed about design, the stickers are made with 100% recycled uncoated paper, with the intention of allowing little ones to add their own personal flair. Currently there are 33 designer stickers to choose from for repurposing cereal boxes, shoe boxes, mac & cheese boxes, tissue boxes and egg and milk cartons into toys. At first (despite my mention of our love for stickers) I thought ‘Really, how long can this entertain a 2 year old for?’ so we tried right after breakfast. Turns out: about 30 minutes at our house. And that’s just the time it took to stick the stickers on… we played with the finished products for more time. No joke. I was amazed. FABULOUS. The stickers peeled off easily, and the actual stickiness of the backs was just sticky enough for us to unstick and stick again when we messed up a bit. 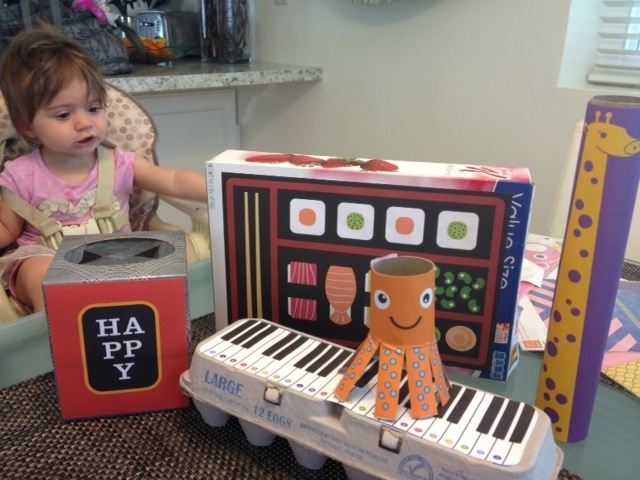 When we were done, we had a giraffe, an octopus (our fave), a kitty-cat box, a bento lunch plate and a mini-piano. My 1 year old even got into the act with fiddling with the scraps and examining the finished products. Related: FIND! weeSpring: Social shopping for new & expecting parents. I was even surprised how much I enjoyed doing something out of the ordinary.I’m telling you: we had a ball. This was a lot more fun than our been-there-done-that coloring books (and we LOVE our coloring books). The only issue I ran into was that the cereal-box size was a bit small for the cereal box I had available… and I didn’t enough empty boxes around to stick the stickers on! 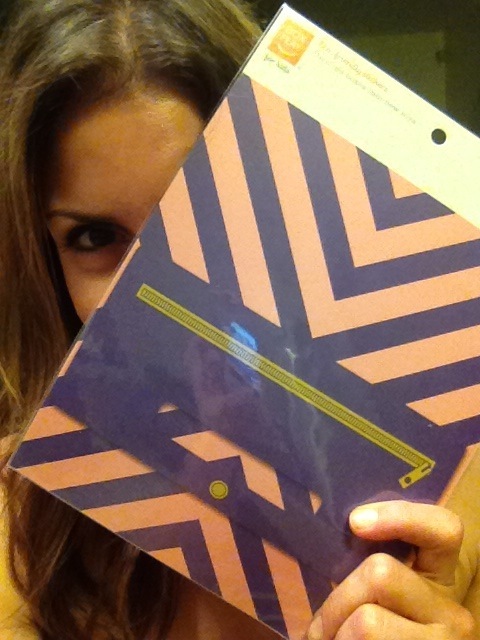 (Looks like I might have to start buying more macaroni & cheese just so we can make that fabulous clutch-purse.) But these “issues” can hardly be considered issues, people. If YOU want to get in on this fun, Box Play is inviting fans to take part in their Kickstarter program to raise $12,000 BY MAY 8. 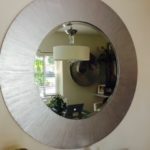 With the funding, the company plans to increase inventory, hire part-time fulfillment and sales support, attend trade shows and implement a new PR and online marketing plan to gain more brand awareness. Backers on Kickstarter can pick from a pledge as little as $5 or more to $150 or more. If their goal is met by the May 8, 2013 deadline, backers of $10 or more will be rewarded with sticker sets outlined on their Kickstarter page. Box Play for Kids is a privately owned company based in Phoenix, Arizona. 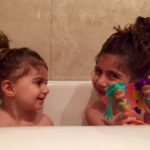 The company’s one-of-a-kind, patent pending product line is proudly made in the USA and is available on boxplayforkids.com as well as in select kid’s boutiques, museums, toy stores, grocery stores and online retailers. Stickers retail for $3 and $7 for individual stickers, $7-14 for themed collections and $20-35 for party packs. SO WHAT DO YOU SAY? YOU IN TO BOX PLAY FOR EARTH DAY? TheFabMom was generously gifted a set of Box Play stickers for purposes of review & commentary on this site. FIND! 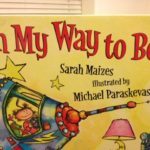 On My Way to Bed, by Sarah Maizes.